While Crème Brûlée may be thought of as a fancy restaurant dessert, it can be made at home. Don't let it intimidate you, as it's simply a vanilla flavored custard that is baked and then topped with a layer of caramelized sugar. To me, it's that delightful layer of brittle caramel that makes this pudding so special. I love how your spoon has to first crack through the caramel's smooth crispness before you can get to the silky smooth cold custard that lies underneath. The contrast of textures and flavors is memorable. There is quite a debate about whether this dessert is French (known as Crème Brûlée), British (known as Burnt Cream or Trinity Cream), or Spanish (known as Crema Catalana), so I think we'll leave it to the food historians to figure it all out. But what we do know is that it starts with a rich stirred custard, a custard that uses cream instead of milk. The other ingredients needed are egg yolks, vanilla, and sugar. (Some recipes do not sweeten the custard because of the sweet caramel topping.) Vanilla seems to be the traditional flavoring, and while you can use pure vanilla extract or paste, I prefer a vanilla bean to flavor the custard. I like its' sweet delicate flavor and how the custard looks so pretty with all those tiny black seeds. When buying vanilla beans, look for pods that are shiny and black, tender, plump and moist. Never buy hard, dry and shriveled beans because they are past their prime. Don't throw away the pod once the seeds are removed. Wash, let it dry, and then place the pod into your bag of granulated white sugar, and after a few days you have vanilla scented sugar. One debate is whether to bake the custard in a water bath or cook it on the stove over a saucepan of simmering water. My preference is to bake the custard in a water bath (bain marie) as it provides the custard with an even, gentle heat that helps to prevent it from becoming rubbery, tough, or the dreaded curdling. While you can make Crème Brûlée in one large dish, I really like the look of individual ramekins that are both wide and shallow so you get an ample amount of caramelized sugar with each delicious spoonful of velvety smooth custard. So once you have baked the custards just until set (a slight wobble is okay), immediately take them out of the water bath (to stop further cooking) and let them cool to room temperature. Then carefully place the custards in the refrigerator (uncovered) for at least four hours, or until cold and firm. Then shortly before serving, remove the custards from the refrigerator and sprinkle a thin even coating of superfine white sugar (castor sugar) over the top of each custard. I like to use superfine white sugar as I find it caramelizes quickly and easily, although you can use regular granulated white sugar or even brown sugar. So, now for the tricky part, caramelizing the sugar. There are two ways to accomplish this, with a hand held small butane torch (which can be found in cookware stores or on line) or under your oven's broiler. Either way, brown the sugar until it caramelizes and just starts to bubble. Try not to warm the custard as you caramelize the sugar, as you want the contrast of hard sugar coating and cold custard. Once the sugar caramelizes, let the Crème Brûlée sit a few minutes, or until the layer of caramel becomes hard. Then serve and enjoy the smiles of delight from your guests. 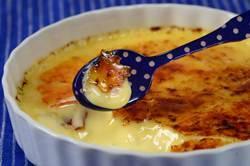 Crème Brûlée: Preheat oven to 300 degrees F (150 degrees C) and place rack in center of oven. Place 4 - one cup (240 ml) Crème Brûlée dishes or ramekins in a roasting pan. In a saucepan, over medium-high heat, bring the cream and the vanilla bean and seeds to the scalding point (the cream just begins to bubble around the edges). Remove from heat and remove the vanilla bean. Meanwhile in a heatproof bowl beat the egg yolks and sugar until thick and pale (about 1-2 minutes). (You can do this with a wire whisk or hand mixer.) Gradually pour the scalding cream into the egg yolk mixture, making sure you keep whisking constantly so the eggs don't curdle. (Stir in vanilla extract, if using.) Strain into a large measuring cup or pitcher and then evenly pour the custard into the ramekins. Prepare a water bath (bain marie) by carefully pouring enough hot or boiling water so that the water comes halfway up the sides of the ramekins. Bake for about 30 - 40 minutes (baking time can vary depending on size of ramekins and temperature of water) or just until the custards are set (a slight wobble is okay). Immediately remove the custards from the water bath and cool to room temperature on a wire rack (about one hour). Refrigerate (uncovered) for at least 4 hours or until cold and firm. At this point they can be stored (covered) in the refrigerator for about three days. To serve, remove the custards from the refrigerator. Sprinkle an even, not too thick, layer (about 1 tablespoon (15 grams)) of superfine sugar over the custards. Using a hand held kitchen torch, or under a very hot preheated broiler, caramelize the sugar until it is golden brown and bubbly. If using a torch, place it about 2 inches (5 cm), at an angle, over the custard and move the torch around until the sugar melts and caramelizes. Let sit a few minutes so the sugar can harden then serve.